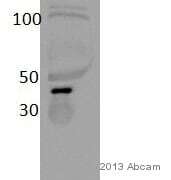 Mouse reactivity: Please be aware that we have received positive as well as negative feedback for reactivity of this antibody with mouse samples. 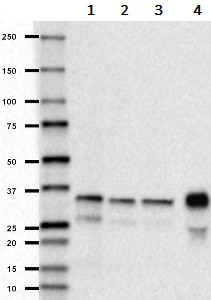 The antibody is not being batch-tested in the mouse samples. Anti-Apolipoprotein E antibody [D6E10] recognizes the E2, E3 and E4 isoforms of apolipoprotein E. It was raised against a peptide sequence corresponding to aa 141-160 of human Apo-E. Synthetic peptide corresponding to Apolipoprotein E aa 141-160. This product was changed from ascites to tissue culture supernatant on 2nd February 2018. Please note that the dilutions may need to be adjusted accordingly. If you have any questions, please do not hesitate to contact our scientific support team. Our Abpromise guarantee covers the use of ab1906 in the following tested applications. WB 1/1000 - 1/10000. Predicted molecular weight: 38 kDa. IHC-P 1/1000 - 1/100000. Antigen retrieval is not essential but may optimise staining. The staining intensity of formalin-fixed paraffin embedded tissues may be significantly improved by pretreatment methods such as: 70% Formic acid for 10-30 minutes at room temperature or Hydrolytic autoclaving. Mediates the binding, internalization, and catabolism of lipoprotein particles. It can serve as a ligand for the LDL (apo B/E) receptor and for the specific apo-E receptor (chylomicron remnant) of hepatic tissues. Occurs in all lipoprotein fractions in plasma. It constitutes 10-20% of very low density lipoproteins (VLDL) and 1-2% of high density lipoproteins (HDL). APOE is produced in most organs. Significant quantities are produced in liver, brain, spleen, lung, adrenal, ovary, kidney and muscle. Defects in APOE are a cause of hyperlipoproteinemia type 3 (HLPP3) [MIM:107741]; also known as familial dysbetalipoproteinemia. Individuals with HLPP3 are clinically characterized by xanthomas, yellowish lipid deposits in the palmar crease, or less specific on tendons and on elbows. The disorder rarely manifests before the third decade in men. In women, it is usually expressed only after the menopause. The vast majority of the patients are homozygous for APOE*2 alleles. More severe cases of HLPP3 have also been observed in individuals heterozygous for rare APOE variants. The influence of APOE on lipid levels is often suggested to have major implications for the risk of coronary artery disease (CAD). Individuals carrying the common APOE*4 variant are at higher risk of CAD. Genetic variations in APOE are associated with Alzheimer disease type 2 (AD2) [MIM:104310]. It is a late-onset neurodegenerative disorder characterized by progressive dementia, loss of cognitive abilities, and deposition of fibrillar amyloid proteins as intraneuronal neurofibrillary tangles, extracellular amyloid plaques and vascular amyloid deposits. The major constituent of these plaques is the neurotoxic amyloid-beta-APP 40-42 peptide (s), derived proteolytically from the transmembrane precursor protein APP by sequential secretase processing. The cytotoxic C-terminal fragments (CTFs) and the caspase-cleaved products such as C31 derived from APP, are also implicated in neuronal death. Note=The APOE*4 allele is genetically associated with the common late onset familial and sporadic forms of Alzheimer disease. Risk for AD increased from 20% to 90% and mean age at onset decreased from 84 to 68 years with increasing number of APOE*4 alleles in 42 families with late onset AD. Thus APOE*4 gene dose is a major risk factor for late onset AD and, in these families, homozygosity for APOE*4 was virtually sufficient to cause AD by age 80. The mechanism by which APOE*4 participates in pathogenesis is not known. Defects in APOE are a cause of sea-blue histiocyte disease (SBHD) [MIM:269600]; also known as sea-blue histiocytosis. This disorder is characterized by splenomegaly, mild thrombocytopenia and, in the bone marrow, numerous histiocytes containing cytoplasmic granules which stain bright blue with the usual hematologic stains. The syndrome is the consequence of an inherited metabolic defect analogous to Gaucher disease and other sphingolipidoses. Defects in APOE are a cause of lipoprotein glomerulopathy (LPG) [MIM:611771]. LPG is an uncommon kidney disease characterized by proteinuria, progressive kidney failure, and distinctive lipoprotein thrombi in glomerular capillaries. It mainly affects people of Japanese and Chinese origin. The disorder has rarely been described in Caucasians. Synthesized with the sialic acid attached by O-glycosidic linkage and is subsequently desialylated in plasma. O-glycosylated with core 1 or possibly core 8 glycans. Thr-307 is a minor glycosylation site compared to Ser-308. Glycated in plasma VLDL of normal subjects, and of hyperglycemic diabetic patients at a higher level (2-3 fold). Incubated with the primary antibody in 5% milk for 16 hours at 4°C. Immunohistochemistry (Frozen sections) - Anti-Apolipoprotein E antibody [D6E10] (ab1906)This image is courtesy of an Abreview submitted by Dr Ryan MacDonald. 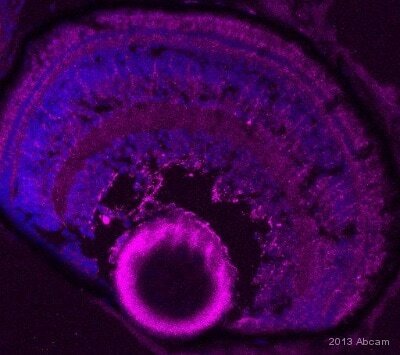 ab1906 staining Apolipoprotein E in zebrafish retina sections by IHC-Fr. The tissue was fixed with paraformaldehyde and an antigen retrieval step was performed with sodium citrate pH 6. Blocking of the sample was done with 5% BSA in PBS containing 01% Tween 20 and 0.5% Triton X, for 60 minutes at 23°C, followed by staining with ab1906 at 1/100 in blocking solution for 16h at 4°C. 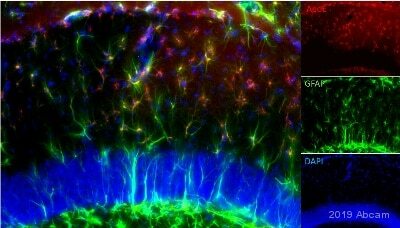 An Alexa Fluor® 647 conjugated goat anti-mouset polyclonal antibody at 1/1000 was used as the secondary antibody. Nuclei are stained in blue with DAPI. Apolipoprotein E expression can be observed in Muller cells. Immunohistochemistry (Formalin/PFA-fixed paraffin-embedded sections) - Anti-Apolipoprotein E antibody [D6E10] (ab1906)This image is courtesy of an Abreview submitted by Carl Hobbs. 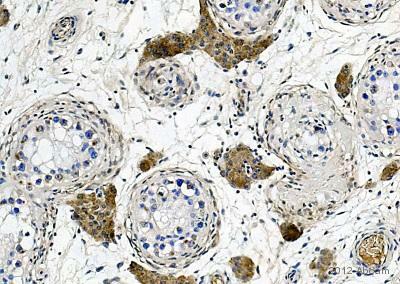 ab1906 staining Apolipoprotein E in human testis tissue sections by Immunohistochemistry (IHC-P - paraformaldehyde-fixed, paraffin-embedded sections). Tissue was fixed with formaldehyde and blocked with 1% BSA for 10 minutes at 21°C; antigen retrieval was by heat mediation in citric acid. Samples were incubated with primary antibody (1/200 in TBS/BSA/azide) for 2 hours at 21°C. 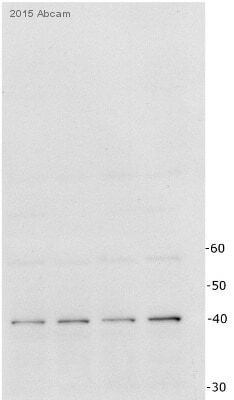 An undiluted biotin-conjugated goat anti-mouse IgG polyclonal was used as the secondary antibody.